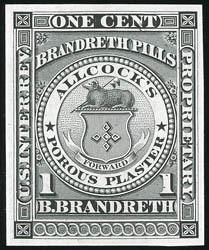 Brandreth, B., 1¢ black, perf'd, silk paper, strong color and impression, corner crease and thin, Fine appearance, rare with only 17 examples recorded in the Aldrich census (10 of which are reported faulty). 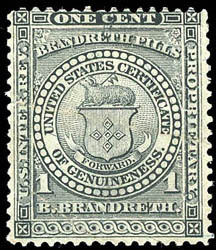 Brandreth, B., 1¢ black, "Guaranteed Genuine" essay, on India mounted on card, stamp size with wide margins, deep color, nick and a few tears slightly detracting, otherwise Very Fine, a very scarce rejected essay which prompted the revision of Brandreth's "United States Certificate of Genuiness" small stamp. Scott No. RS34E Estimate $200 - 300. 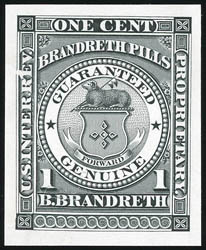 Brandreth, B., 1¢ black, large die proof, on India, stamp size with ample balanced margins, fresh with deep color, Very Fine. 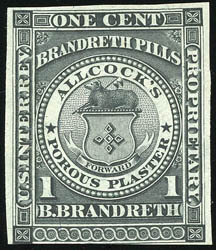 Brandreth, B., 1¢ black, imperf, silk paper, margins ample to in at bottom left, deep color, small tear at upper right, F.-V.F. appearance, scarce and undercataloged, with 31 examples reported.